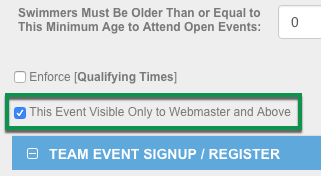 You can hide an event from the public and have it only viewable to Webmasters and above. This is handy when you do not want parents to see what events their kids are in while you are working on the meet. In the side menu click Events & Competition > Team Events. Click the name of the desired event. Click Edit at the top. 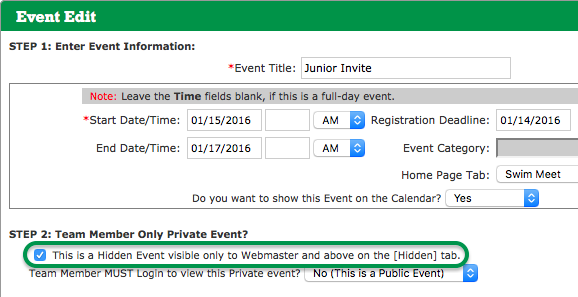 At the bottom of the first section, check the This Event Visible Only to Webmaster and Above box. Click the red X in the upper right. You will now see "(Hidden)" after the event name. If you later want to unhide the event, edit the event again and uncheck the box. Go to your Events tab. Click [Edit] below the event. Under STEP 2 check the This is a Hidden Event... box. Click the Hidden (Admin only) tab to locate this event.